Ever sat down to a fabulous healthy meal, want something more than a water and end up ordering a soda? It wrecks the health of the meal. Even wholesome restaurants sometimes have very little to offer in the way of drinks. Oogave is the answer to little choice. With flavors like - Watermelon Cream, Strawberry Rhubarb, Grapefruit, & Mandarin Key Lime, and more traditional flavors like Cola, Root Beer & Ginger Ale, there is no lack of choice. Agave is a natural, healthier alternative to other sweetners on the market - without loosing flavor. I like it so well, I've sent a request for a local health foods store to carry it! 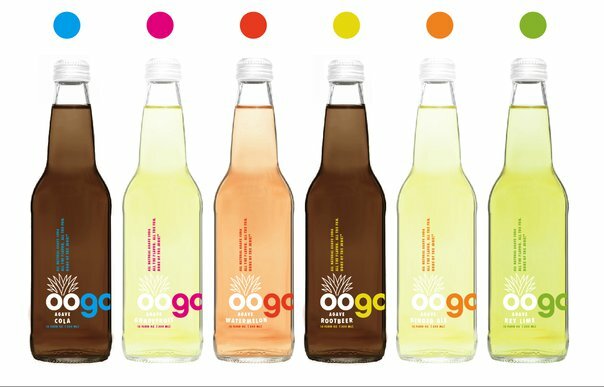 *Follow me @jamaise at Twitter & Tweet this : RT @jamaise #GIVEAWAY #WIN Oogavé ~ Originial Agave Soda ~ Variety Pack ~ Quickie GIVEAWAY!!! ~ http://bit.ly/h2QFvJ Ends 4/22 tweet each day for one entry each ! I can find them at my Ralphs stores. I liked Oogave on Facebook. I liked Wishing Penny on FB. a store called healthy habits sells it.I am a gfc follower. It looks like I can't get it here in Mass, so I would have to order online. I can find Oogav'e at our local Whole Foods. I follow this blog via GFC: Nicolette. Sadly,I don't have one by me,so I'd have to order online.I follow your blog via gfc. Lemongrass Natural Foods Market sells it near me. The closest place is at Jimbo's in Escondido, CA, about 45 minutes away. they sell it at Rollin Oats Market in tampa which is about 20 mins from me not to bad. Like/Fan Oogave - The original agave soda! I can't get this near me, but I can still order online! I can get Oogave at Whole foods in Franklin, TN. I follow through Google Friend Connect. entered "Spoonful of Comfort ~ Chicken Soup Care Package ~ GIVEAWAY!!! Goodwin's Organic Foods. Foolowed you via GFC. I can buy it at my local Ralphs! I can get it at whole foods. The nearest place to us is about 20 miles away. I can't get Oogave within a 3 hour drive of me...but I do follow your blog!! I like Oogave on FB as Trisha Durham!! I like Oogave on Fb as Trisha Durham! AAF of Wishing Penny on FB as Trisha Durham. I can buy at Bonterra Market in NJ.